Every year, during Super Bowl week, Immigration and Customs Enforcement (ICE) agents are pulled off from their duties to work for National Football League billionaires, courtesy of you–the American taxpayer. (ICE agents also do this for the NCAA, Major League Baseball, etc.–during their big events.) I’ve written about this repeatedly in the past (including here and here and here). And sadly it keeps happening, including at this year’s Supe. Even worse, the ICE agents are there to enforce NFL restrictions on free speech which, if challenged in court, wouldn’t hold water. 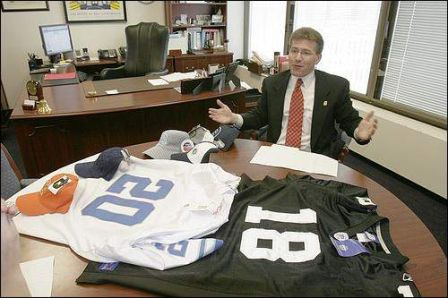 In the past, for example, ICE agents roamed the streets before the 2006 Super Bowl in Detroit, seizing t-shirts and sweatshirts from some poor shnook vendors, with sayings like, “Detroit Football” or “Super Football Week” emblazoned on them. 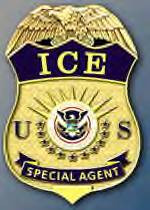 (ICE Michigan/Ohio Special Agent in Charge Brian Moskowitz a/k/a “Abu Moskowitz” spent tax dollars to make a special NFL ICE Super Bowl pin for the agents.) 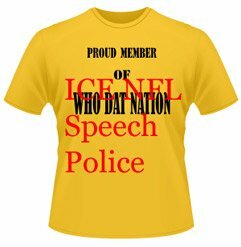 The NFL even works with ICE to publish a thick manual filled with phrases and words on shirts that deign them “forbidden” and subject to seizure. Oh, and lest you worry that your game tickets will go up in price, they will, but you–the American taxpayer–paid for this manual and the time spent on putting it together (a new manual with new cities’ and teams’ names and similar sounding names is compiled each year). Sorry, but the NFL–which does not own the exclusive rights to the game of football or the use of the words “Super and “Detroit”–has no right to do this. The League has no legal trademark or legitimate property rights to these words. Still, uneducated, frightened, and mostly minority vendors are afraid of guys with guns and badges and willingly give up the merch, when they’re told that if they give it up, they won’t be arrested or prosecuted. It makes me sick because it’s complete thuggery. 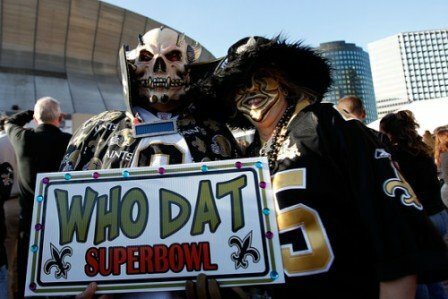 The NFL recently obtained an order through the Florida Department of State for the rights to “Who Dat?” a slang term you can hear in virtually every Blaxploitation film, BET program, stupid Tyler Perry flick (redundant phrase), or Al Sharpton-Sean Vannity love fest. It means, “Who’s that?” And you can also hear it on the Cajun streets of New Orleans, where fans–both Black and White–of the New Orleans Saints, projected onto their beloved, forever-losing team . . . a team which is now miraculously in this weekend’s Super Bowl. So, in addition, to unconstitutionally restricting the free speech and commercial rights of vendors of t-shirts that say “New Orleans Football,” this week, ICE agents in Miami will be seizing “Who Dat” t-shirts. It’s funny how the mostly White guys atop the NFL now own the rights to a stupid slang saying for the ebonics crowd who can’t–and refuse–to speak English. And it’s really something that would never pass muster before the Supreme Court. ICE’s PR machine claims that seizing the clothing loot will stop terrorists. It’s beyond hilarious, since ICE has never once investigated the clothing, which is usually made in someone’s basement or screenprinting shop to give someone some extra cash to survive in a tough economy. ICE usually either destroys the clothing or gives it to charity. And that’s the end of it. Never once has Hezbollah or HAMAS been caught selling at the Supe. It just doesn’t happen. And if it did, the NFL would probably want to get in on the action, rather than shut it down. Contrast this with the real Hezbollah and HAMAS clothing–counterfeit designer duds being sold every day at the Detroit area’s Gibraltar Trade Center by Palestinian Sunni and Lebanese Shi’ite Muslims. ICE looks the other way on that, but not the Superbowl street vendors. And the Department of Justice has never once pressed charges against a single vendor from whom ICE seized clothing at the Big Game. It’s a joke, and all the ICE agents know it. I don’t blame the ICE street agents who are doing this. They’re not the thugs. It’s their bosses at the top who make them do this that are. The street agents are happy to get the perk of walking around Super Bowl venues and seeing the events going on. They’d rather be arresting illegal aliens and enforcing Customs laws. But increased paperwork and restrictions on arresting illegal aliens put forth by Homeland Security Chief Janet Napolitano a/k/a “The Lesbionic Woman,” now make that nearly impossible. Agents tell me they now have to fill out something like seven long tedious forms to arrest an illegal alien, and have approval from ICE headquarters in Washington first. You call that immigration enforcement? Only if you’re an idiot. And these guys aren’t. They don’t want to be known as “ICE . . . Taking T-shirts Since 2003.” They’re frustrated. And we should be, too. Federal agents who should be spending their time investigating illegal aliens in our midst, marriage fraud rings, and those importing and exporting goods that finance terrorism are, instead, working this week for a private illegal monopoly without an anti-trust exemption–a monopoly that now thinks it can deem that it owns whichever words in the dictionary it chooses. There’s nothing more unAmerican than that. And how ironic that it takes place at the most American of events . . . the Super Bowl. Have fun at those Super Bowl parties, Miami ICE agents. But I know you won’t have fun taking some poor guy’s t-shirts, when he’s done nothing illegal to speak of. And I know you’re sorry that this is what you’ve been reduced to–the NFL’s Public/Private Seizure Team. The NFL makes “chop blocks” like this illegal on the field, yet off the field, it’s A-OK. It’s big government, Big Brother, and the speech police at their worst. We all have a First Amendment to sustain. Not by using tax-paid federal agents to work against it. If the NFL truly thinks its trademarks are being violated, let the No Fun League hire its own trademark enforcement force, like every other company and private party has to do. This is not a taxpayer function and it certainly has nothing to do with a single mission of ICE. America needs more ICE agents on the job, NOT more “Who Dat?” police. 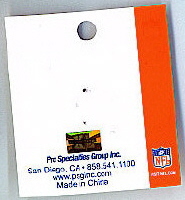 Tags: Big Game, ICE, ICE agents, Immigration, Immigration and Customs Enforcement, Miami, New Orleans, NFL, NFL Police Force, Supe, Super Bowl, Superbowl, Trademark Enforcement, Trademark Police, Who Dat Police, Who Dat? Debbie, in other words, the NFL gets to have a taxpayer-paid private police force. Nice work if you can get it. Ms Schlussel: Thank you for running this story. This egregious abuse of our ICE agents (and suppression of these vendors’ First Amendment rights) is outrageous on several levels. You pull no punches. This makes me loathe the NFL hierarchy. What empty suits they are. These agents are not brought in from the neighboring offices, no sir Debbie. They come from west coast, east coast, hawaii, southwest, at TREMENDOUS cost to the taxpayers. ICE is now a private security firm for all these clothing manaufactuerers who need armed people to enforce their trademarks. This year it will happen with the MLB All Star Game. but the fun dont stop there. Ask ICE why its OPR agents get GS-14 pay for doing administrative cases and why almost all of these lucky paper pushing overly paid agents in OPR are legacy Customs agents. And ask why ICE has agents do strictly admin support staff work, like Confidential Informant coordinator, range instructors, training classes coordinators. Heck, one OPR agent went from no criminal casework from hiring to a 12, to one year as a 13, to a 14 in OPR and now is a 15 in HQ! OUTRAGEOUS! What do you expect from a government that is more interested in changing the NCAA BCS than attending to more important things, like terrorism or the economy. Only in America (well maybe Britian) can a billionaire trademark common words, phrases, colors, and even a number. Then they run TV spots exhorting people to not “steal” these things and try to make us feel guilty. We can’t fight back because of dedicated law enforcement officers, ready to lay down their life for these elites. I personally know one federal agent who is now a bodyguard to the rich and famous. He was a good deputy sheriff in our county but his bloated ego dad, a former FBI man didn’t think that was good enough. Now he does stuff like this, what a waste. Do the NLF, MLB and NCAA make campaign contributions to certain politicians to get these privileges? Do they give favored seats to any of these politicians? What is happening for them to get this kind of favored treatment? How are the agents chosen? Are they the ones who arrest the fewest illegal aliens? This is still happening because Marcy Forman is the curent head of the IPR Center in DC and still has a hand in this nonsense. Rumour has it that Jim Dinkins has other plans for Ms. Forman in the not-too-distant future (and her sister Mona may soon follow); hopefully, this BS will stop soon. BTW, ICE can only seize items with an international nexus (i.e. importations); they cannot seize goods basedon a state order unless the state grants some sort of enforcement authority for an expres limited purpose. I am not aware that this is the case; more likely, ICE is using Title 19 authority to confiscate these goods from vendors. Yeah, why dont they get rid of Peppermint Patty… Still trying to make one big last hurrah so she can launch herself into a cushy high paying job in the private sector Im sure..
DOnt get me started on OPR folks making GS 14 pay… Look at the ones from HQ, no crim cases, just audits and inspections, travel, both domestic and foreign… Its good for the folks in those spots.. But to me, the biggest disgrace is the 343 series Management Program Analyst.. GS-14 pay for doing admin work.. Waaaaay too many of them at HQ. Funny thing, you have the 343 analysts doing the same work as 1811 criminal investigators in OPR and in Office of Investigations. Agency is still so broke and changing of the guard did nothing. Do anyone really think they were sent to work? NO it is party time. Hell you find illegal vendors on any block during Super Bowl week. Can we get some music for this assignment as they watch scantily clad women walk down South Beach. As Will Smith sang “Welcome to Miami”. South Beach, IMHO has the most beautiful variety of women in that I have seen. San Diego, Las Vegas, and Hawaii come close. I want their jobs. If the NFL claim to exclusive rights to certain words and phrases would not stand in a court of law, why is it that no one or even no lawyers are challenging that in any court? I understand your sentiment regarding the poor guys selling T-shirts. In poor neighborhoods in the inner cities in this country it is a choice of selling drugs or selling custom t-shirts etc. Going by the actions of ICE, I guess they would rather see these poor dudes sell drugs instead of selling t-shirts etc. Some priorities. I am an ICE Agent. I have been in government service in law enforcement for 30 plus years now and never heard of anything like this before. Simply amazing but I have to wonder how it is that I have never heard it even hinted at before – is this a super seKrit work assignment? Oh goodness me – were you talking about the just and proper authority inherioted by IC from the former U.S. Customs Service by which Customs Agents enforced trade mark laws, smuggling of fraudulently marked merchandise (such as is often sold at sporting events0 and so forth. I do not recall you ever having a problem with this when it was enforced by Customs. While ICE and DHS may be jokes, enforcement of laws regarding copyright, trade marking, and so on are only here to protect the consumer and the manufacturer of the real McCoy. I have been a long time regular reader of your site, and a loyal fan, but you owe ICE Agents an apology on this one. You never had a problem with it before ICE was established (as in when Customs enforced these same laws) and obviously only have one now because of your personal peeves with the lack of enforcement of immigration law (yes that lack of enforcement is a fiasco), and because of your pet peeves with certain people in ICE management. Shame on you. Dear Ms. Schlussel: This may sound silly and irrelevant, but if a lawsuit about the rights to “Who Dat?” comes up, it might be useful. When I was about 11 or 12, I was horse-crazy and read alot of horse stories, including, over and over, Mary O’Hara’s trilogy about the McLaughlin family and the Goose Bar Ranch, My Friend Flicka, Thunderhead, Green Grass of Wyoming. “Who Dat” was the name given to one of the colts born on the Goose Bar Ranch. He was Gypsy’s foal, born the night she died. Anyone besides me remember Thunderhead, and how Gypsy’s death lead to a reconciliation between Rob and Nell McLaughlin and Rob and Nell making love in the blizzard? Some lawyer might want/be able to use the fact that a horse named “Who Dat” appears in a work of fiction written more than 60 years ago to prove the PHRASE has been around for decades and doesn’t belong to anyone. Miranda, wouldn’t the “rights” to the phrase belong to the Author or the O’Hara heirs if they were astute enough to renew the copyright as have the heirs to “Happy Birthday” ? It’s part of her body of intellectual property, after all. Debbie, what say you? Sorry Debbie but those agents are just as guilty if not more so than their bosses. Every law enforcement official and military personel has the DUTY TO REFUSE TO FOLLOW AN UNLAWFUL AND UNCONSTITUTIONAL ORDER!!! Following the illegal orders of their superiors is no diffrent then Nazi guards following orders of their superiors and you know it. Stop making excuses for them. They can stand up for themselves but the CHOOSE not to. They could tell their bosses NO but they CHOOSE not to. This will now be an issue in the U.S. Senate and House. It must end. ICE. Who dat? 6,000+ $100,000+ a year clerks with take home G rides who are forbidden to arrest illegal aliens. WTF? Dear mk750: Interesting point. MY point was that the phrase “Who Dat,” baby talk for “Who’s that?” was AROUND and COMMON 60 years ago.